Fender Jazzmaster pickups are an underrated design often assumed to be only useful for surf music. According to published material on the subject, Fender was trying to sophisticate their image, while at the same time expand their territory into Gibson’s hold on the jazz player market. Due partly to the radical look of the guitar design, the Jazzmaster never developed a following among jazz players, but did do fairly well with rock and surf players. But they can actually make good blues and rock guitars. Some notable players include Mickey Baker, Magic Slim and Don Wilson. The Jazzmaster is one of my favorite guitar designs. I was fortunate to obtain an original 1959 model with the gold anodized pickguard and what appears to have been burgundy mist finish. According to the Fender custom shop this finish was available that year on a few instruments that were displayed at the 1959 NAMM show. It’s really comfortable to sit or stand with, and I like the slower action of the whammy bar compared to the strat. Because I like the design so much I had ivory and black pickup covers made for sale with our Jazzmaster pickups in addition to the standard bright white finish. The black pickup covers are not available anywhere else. The Lollar Jazzmaster pickups have a tone that falls somewhere between a Strat (sparkle and chime) and a Les Paul (midrange and bass). The fat tone is accomplished by the large surface area – approximately 1.5” X 3.5” inches. In comparison, a Strat pickup has a surface area of approximately 9/16” X 2-9/16” inches. The detailed treble of the Jazzmaster is partly due to its single coil design and its rod magnets used as individual pole pieces. The fuller bass and midrange is due partly to its large surface area that senses a longer portion of the string. In comparison, the much narrower Strat design senses a shorter length of string, resulting in a more focused, bell-like tone. 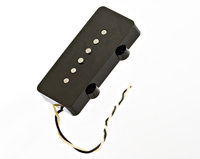 Vintage design Jazzmaster pickups have a coil only 1/8” tall, compared to the height of a strat at about 7/16” tall. Having such a short coil limits the amount of wire you can get around the magnets. It takes a far wider coil for the same amount of turns on a more traditional design single coil like a Strat, Jaguar or Tele pickup. Wound to the same amount of turns, a Jazzmaster is 1.5” wide compared to a Strat at 9/16” wide. This means the coil wire travels at a greater distance on the Jazzmaster bobbin, resulting in more feet of wire per turn. The Jazzmaster dc resistance (in K-Ohms) reads much higher than a Strat, even though the output is very similar between the two designs. The Jazzmaster and Strat actually have a similar amount of turns and share a lot of similarities in design, yet they have quite different tone from each other. Wind a Jazzmaster and a Strat coil to the same amount of turns and the Jazzmaster will read about 8K ohms but the Strat will only read about 6.4K ohms. The frequency response is quite different but the output is actually about the same. The Jazzmaster seems somewhat louder than a Strat pickup due to the increased bass and mids, but the extra fatness is somewhat misleading as far as the actual voltage produced. You’ll notice the amount of distortion the amp produces is similar to running a Strat at the same volume level, whereas a pickup like a humbucker or P-90 will drive an amp a lot harder at the same volume setting. Japanese made Jazzmasters (CIJ models) have pickups made like Stratocasters and do not sound the same as vintage or American made models. These pickups use a standard Jazzmaster pickup cover but underneath is hiding the equivalent of a Stratocaster pickup. Another factor that affects tone is pole piece magnet length. The Jazzmaster magnets are only ½” tall compared to typical Strat pole piece magnets at about 5/8” tall. The shorter magnet has less power, so this softens up the treble response of the pickup. Next week’s blog will discuss a few idiosyncrasies of the overall Jazzmaster guitar design, how that relates to tone, and a few mods that have good results.